The SW Florida real estate market has been a steady as she goes type of market through 2015 with mostly upward price gains, falling inventory, and higher pending sales than last year. This changed in September as pending sales fell for the first time to below 2014 levels. Median sale prices have been up over 2014 all year, and September saw this largest yearly gain for the year at a 20.9% increase in median price. Average price tells a different story. We’ve had three negative months this year compared to last, and we’ve had two months (March and July) with average prices up over 30%. For the most part average sale prices have been more tempered though. 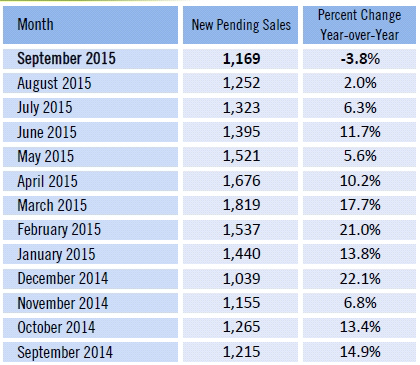 New listings in September increased over August by 59 homes but were down 6 homes from last year. 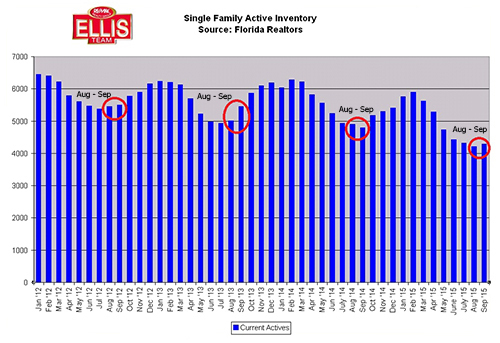 So if new listing inventory fell by 6 homes this September versus last year, how is it that inventory actually rose in September versus August? Some pending deals must have fallen out combined with fewer new pending sales in September would explain it. We would have thought with new Federal lending laws going into effect Oct 3rd we’d see more pending sales in September but that didn’t occur. Again, we caution about reading too much into monthly numbers. You’ll see from the Active Inventory graph listings in September fell last year, but they actually rose the previous two years. So this isn’t a new phenomenon or trend. We’re also keeping an eye on median prices versus average prices. Average prices can be skewed by large sales so it isn’t as reliable, but if there is a trend we want to know. As prices rise the market begins to price out some home shoppers. This can account for why pending sales decline. Rising home prices affects home affordability. If wages increased home buyers could afford more. There is probably more room for price gains as not all of our buyers in SW Florida are dependent on wages. Some are buying 2nd homes, retirement homes, or investments. Rising rents make these investments even stronger. Another thing that could drastically affect affordability is interest rates. As rates rise it changes the affordability equation. We’ve already seen an uptick in rates and more are expected. With prices increasing we expect more homeowners to put their home on the market. If and when that happens, buyers will have more choices. We’re about to see all market forces come into play. When the market crash we saw a few market forces cause the crash, and in the recovery since we’ve seen a few market forces influence the market. Going forward we’re going to see all market forces sway the market. This is a sign of a healed housing market. We’ll see less volatility and more economics in play. 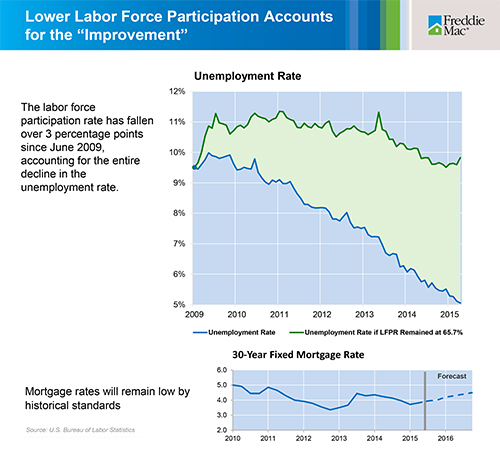 We’ll be looking at wages, inventory supply, new construction supply, oil prices, unemployment, labor force participation, interest rates, national and global conditions. It really is exciting to get back to normal market conditions as buyers and sellers can more comfortably predict the stability of the market. We are not seeing overbuilding by the builders. In fact we could use some more building. If you’re a buyer and want to search inventory visit www.LeeCountyOnline.com It has all the listings and it’s updated every 5 minutes. Search the Entire SW Florida MLS – Updated Every 5 Minutes, so you’ll be sure to get the latest listings Fast! We often get asked, when is the best time to put your home on the market? Homes sell pretty well year round in SW Florida. Condos tend to do a bit better in season, but even that is changing depending on the area. We have more visitors to SW Florida once the New Year arrives and it culminates in February and March, but really we’ve seen more visitors to our area the past few years starting in October. Just take a look around and you’ve probably noticed our streets are a lot busier this past week. I always look at the RV’s. When I see RV’s flood in I know they’re back, and you can watch them leave around Easter time or tax time. One thing we notice statistically is more sellers place their home on the market in January-February each year. While we have more visitors here at that time; you also have more competition from other sellers. 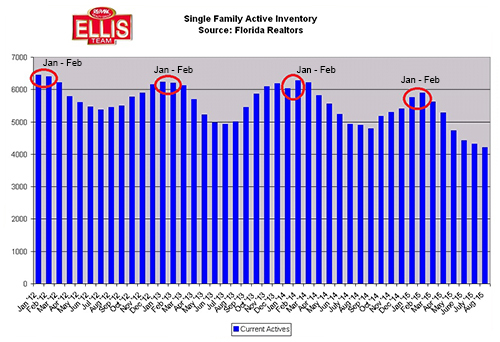 As you can see from the graph, listings tend to peak around January or February. One might point out that the reason they go down in March and April is because they sell, and this is true. However, it doesn’t explain why they spike in January. 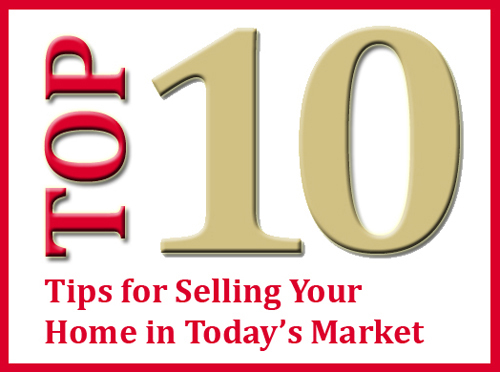 We hear many sellers who are trying to catch the market, or catch that top end buyer in season. We think seasonal buyers research the market and don’t like over-paying just like the next buyer. Many times they research from home on the Internet before they even arrive. The difference is we have more affluent buyers with more money here in season so they buy some of the more expensive second homes which raise our averages. It isn’t because they over-pay. It’s because they’re buying a different price point. The savvy seller will look at the graph and decide if putting their home on the market now makes more sense than waiting. Obviously you have to weigh considerations like where you’re going and when that home will be ready. If timing on your next home isn’t an issue, it may make sense to sell now versus waiting. Selling now allows you the opportunity to sell when fewer homes are on the market. You also avoid potential rate hikes which can lower buyer’s purchasing power. And if you’re financing your next home, you can lock in lower rates today ahead of future rate hikes. When you wait, you can’t calculate the true cost of owning because of variables. Buyers today are in a frenzy. Rental prices are high and inventory is limited. Multiple offers are common. It’s truly a great time to be a seller. In January, we have lots of lookers, but not all buy. The locals don’t buy as much in season because they’re busy working. With higher inventory levels and less locals buying, you’re banking on seasonal buyers loving your home against all the other competition. If nothing changes, both times will be a great time to sell. We’re just saying there are some advantages to doing it now. A lot of the risk is gone if you’re successful now. And if you’re not, you still have season coming up and time to adjust. If you’re thinking now might be the time to start looking at this, give us a call 239-489-4042 We can give you a market analysis so you can decide your options. Feel free to Search the SW Florida MLS for your dream home You can search for your next home or check on your competition. Remember, not all agents are the same. Our sellers average almost $10,000 more per sale than the average seller. Call us and find out how we can put our proven program to work for you! We’ve got some hot new listings that hit the market you might want to check out.